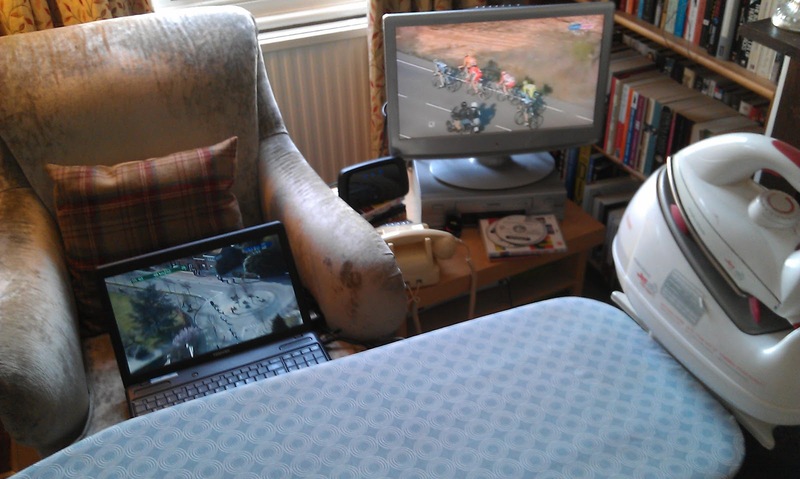 That's Sporza's coverage of E3 Prijs Harelbeke on the laptop to the left, and Eurosport's coverage of the Volta a Catalunya coming through XboxLive on the right, and my ironing in the foreground. What did we do before the internet? Well, quicker ironing for one thing. Still, I've seen Boonen attack on the Taaienberg, Cancellara crash and Gilbert fall off the back. There's probably stuff happening in Catalunya too, but I can't tell, as I've chosen to listen to Sporza's Flemish commentary despite not understanding a word of it, which tells you all you need to know about Dave Harmon's Eurosport witterings. As they say in Belgium, "Eh pembernijt eker glare von aller Boonen my noaky? Karel?"